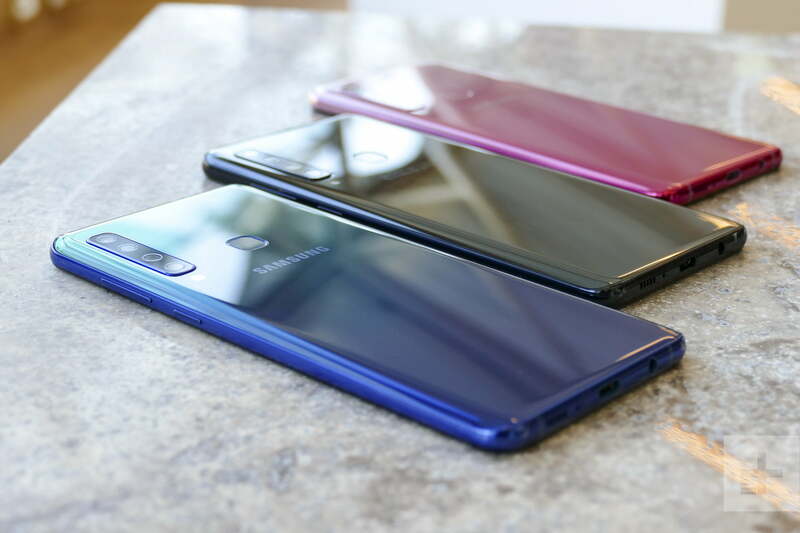 Samsung sees what OnePlus, Honor, Nokia, and several other smartphone brands are doing with strong mid-range smartphones, and has been wondering why its own Galaxy A series devices aren’t attracting the same level of attention. It’s probably because until now, they haven’t been all that exciting. But with the new 2018 Galaxy A9, Samsung has given us all something to gaze upon with envious eyes. 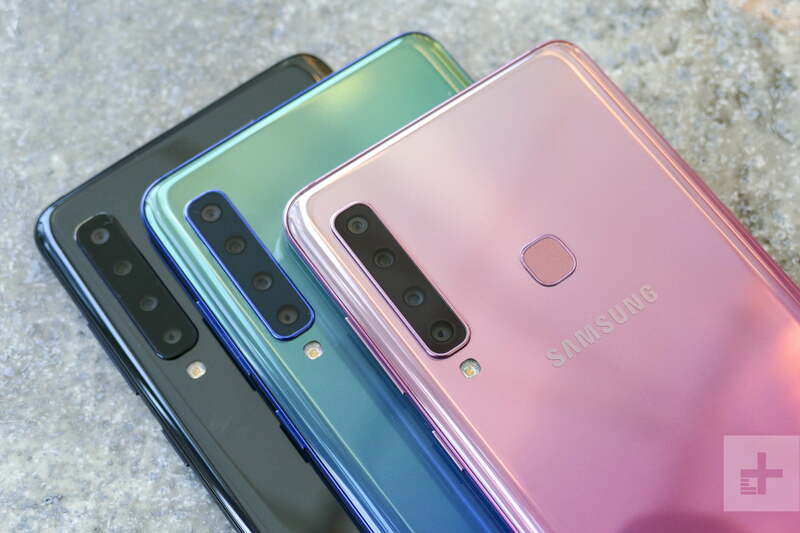 The Galaxy A9 stares back through four camera lenses on the rear. It’s a world first feature — there have been phones with more camera lenses, but this is the first with four on the back — and is especially notable because Samsung has added a desirable feature to an A series phone that you won’t find on flagship Galaxy S devices. Stacked vertically on the left of the A9, the four lens setup consists of a 24-megapixel main lens with an f/1.7 aperture, a 5-megapixel depth camera with an f/2.2 aperture, a 10-megapixel f/2.4 aperture ultra-wide lens, and finally an 8-megapixel telephoto lens, also with an f/2.4 aperture. The Galaxy A9’s quad-lens camera array covers all the bases. You can take strong standard photos in low light, bokeh-style portrait shots using Samsung’s Live Focus mode, ultra wide photos with a 120-degree viewing angle to match human vision, and zoom in with the 2x optical zoom feature. There really isn’t anything missing here, and it fits perfectly with Samsung’s target market — Instagram fans, and those who want to take the best, and most shareable photos without buying a flagship device. How did it perform? We used the camera inside on a very sunny day, so conditions were challenging. We loved the simplicity of switching between the modes, as it’s an obvious button in the viewfinder, and there was no lag when we did so. Putting a quad-lens camera on the back of the Galaxy A9 is quite daring for Samsung. Live Focus is something we’ve enjoyed on the Galaxy Note 9 and the Galaxy S9 Plus, and it also worked well here with clear on-screen instructions and strong end results. The ultra wide camera has a noticeable fisheye effect, something LG has moved away from with the G7 ThinQ, and the difference in aperture was obvious too, with the ultra wide lens not coping with the bright conditions in the same way as the regular lens. It was a very limited test, but we were impressed at the camera’s versatility. This level of functionality is rare on any phone, let alone one that’s not classed as a flagship. Samsung has even squeezed in its scene recognition technology that debuted on the Galaxy Note 9. The camera app is the same as you’ll find on other Samsung phones too, and it was speedy, logical, and feature packed. The only phone with this type of versatility is the LG V40 ThinQ, which packs three cameras on the rear, and two on the front. Putting a quad-lens camera on the back of the Galaxy A9 is quite daring for Samsung, which has routinely made decent but uninspired A series phones. We’re pleased to see the investment in the camera hasn’t stopped it making the rest of the phone feel and work in a premium fashion. The body is made from glass and aluminium, and is very comfortable and light in the hand. The 6.3-inch screen looks wonderful, and it’s another excellent example of Samsung’s Super AMOLED panels, with a Full HD+ resolution here. If the camera turns your head, it’ll be one of the superb color choices that you notice next. There are three to choose from — a shiny caviar black option for the boring, or a stunning bubblegum pink and lemonade blue for the outrageous. The pink model looks amazing, with real depth and shine to the finish, while not veering into a hideous lipstick pink you’ll want to cover with a case. The lemonade blue reminds us of Huawei’s twilight option on the P20 Pro, with a subtle green-to-blue fade. Both are winners. The software is identical to other Samsung phones, and is based on Android Oreo here, with an update to Android Pie promised in the future. It’s slick and fast, although Bixby is also front and center, which few people will welcome. Samsung’s less-than-successful assistant can be pulled up with a swipe of the screen, or a press of the dedicated Bixby button on the left of the device, which also activates Bixby Voice. Outside of Bixby’s questionable usefulness, Samsung’s version of Android is visually attractive and was pleasantly responsive in our time with the Galaxy A9. We’re as guilty as many others for passing the Galaxy A phones by in the past; but that’s going to stop with the 2018 Galaxy A9. It’s powered by a Qualcomm Snapdragon 660 with 6GB of RAM, and 128GB of internal storage space, plus room for a MicroSD card up to 512GB in size. No, it’s not a full-on Snapdragon 845 like the OnePlus 6, but for those who aren’t so demanding when it comes to games or multi-tasking, it’ll be plenty fast enough. A 3,800mAh battery should last at least a day, and it has USB Type-C fast charging, but not wireless charging. There’s still Samsung Pay, Samsung Health, and all the other features you’d expect to see on, well, a Galaxy S phone actually. That’s what we liked most about the Galaxy A9. The camera gave us reason to want to use it, and didn’t disappoint when we did, and the rest of the device continued to live up to the expectations we usually have for Samsung’s more expensive phones. We’re as guilty as many others (Samsung included) for passing the Galaxy A phones by in the past; but that’s going to stop with the 2018 Galaxy A9. About the price. There’s a reason the phone feels so close to a Galaxy S phone, as the Galaxy A9 costs 550 British pounds, which converts over to $725. Should the Galaxy A9 launch in the U.S., it will likely be less than this, so we’ll compare using the U.K. price here. It’s slightly more than the 520 pound OnePlus 6, and quite a lot more than the 400 pound Honor 10. We would be more conformable with the cost if it was somewhere in the middle of these two. Still, this is a premium Samsung experience we’re talking about here, from the build quality and materials, right down to the software and camera setup. It has a unique feature you won’t find anywhere else, along with many Galaxy S and Note device features, and the desirable Samsung brand name, all for considerably less than the cheapest S9. Currently, the 64GB Galaxy S9 is 680 British pounds. Looked at through Samsung’s lens, it’s a mid-range phone. Competition is tough around this price, and with the 2018 Galaxy A9, Samsung has got a real contender on its hands, but we can’t help but wish it was just a tiny bit cheaper. November 19, 2018 Tech News Comments Off on How Does Fast Charging Work?